Personalized piggy bank keychain –blue can be considered for gifting by marketers who wish to impress their crowd by offering value effective gifts. This piggy bank keychain advocates about savings and it can be easily managed within pockets or purses. This piggy bank can be carried to schools and kids can use it for managing small coins or changes. It can be gifted during conventions, school events and school fundraisers. 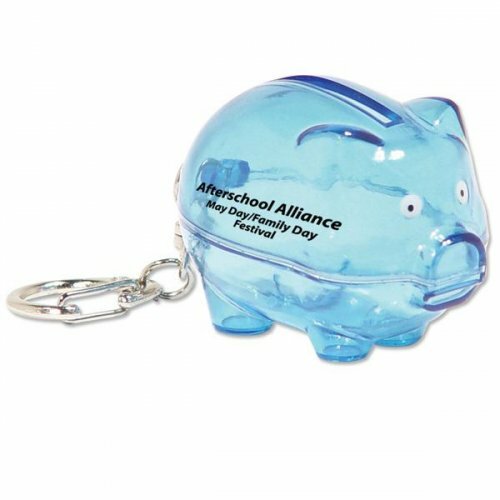 We offer attractive price savings on bulk orders of this custom piggy bank keychain – blue. Request a quote to know price benefits that you can avail on bulk orders of this custom piggy bank keychain – blue. Features – Blue plastic piggy bank with strong key holder. Imprint area – 1/2" x ½"